For my progress posts this time around, I want to elaborate more about the whole experience, rather then just progression photos day by day. I want to discuss the struggles and the teachings that go beyond just stretching exercises and poses. The first 2 weeks in the 100 day flexibility challenge have been difficult, trying to move out of my 1 hour/2 days a week winter routine and back into the consistent 2 hour/4 days a week routine. I have a lot going on, here’s my list of excuses, my mind kept trying to convince me of. Chilly Weather, feel like I’m still coming out of hibernation mode slowly but surely. Everyday work and maintenance tasks on top of all that. The truth is, it never stops, we can always come up with excuses as to why we can’t stretch. If we want to do something, we have to make the time, and think of it as a sacred time. Maybe it’s just 30 minutes doing only the warmup and dynamic stretching routine, or maybe it’s an hour also working on static stretches and a few poses. It doesn’t matter even if it’s 15 minutes, just loosening up doing the breathing, posture and form routine. I was getting worn out from everyday life, and taking the time to breath, strengthen and stretch was exactly what I needed to get back in the game feeling strong. Especially when I’m outside breathing fresh air and feeling the breeze. Even just little stretches here and there help my flexibility poses immensely; fixing my posture all throughout the day, engaging my core, pulling shoulders down, pulling neck up, tucking hips under, standing tall into hip flexors and quads. Really it’s just being aware of my muscles and my breath. The more I do it the more it becomes a habit and the easier it becomes. For the most part stretching feels amazing, of course when you push yourself past your comfort zone you get an intense sensation, but it’s not necessarily a bad feeling. If you can breath through this sensation and try to find new comfort in these new ranges off motion by relaxing and engaging specific muscles, you’ll have gained flexibility. They always say growth happens outside of your comfort zone. I totally believe that with stretching. Even if you have your splits, there is still more to do, like fixing form; squaring the hips, building the muscles in the split, over-splits, splits in the air with no outside force, backbends in split, etc. more on this topic later. A lot of times we resist anything that doesn’t come easily, or the unknown, but really we need to focus on the things that are difficult so we can make necessary balanced improvements. Life is one big balancing act that never ends. Here’s an example: I have my left side split, cold no intense sensation. I focused on my left split because it’s more comfortable and I can advance to more difficult poses easier. But if I keep neglecting my right leg split, I’ll have uneven muscles, and my hips will pop and feel uneven while walking. No good. Now I’m focusing on correcting this by going outside my comfort zone and really working that right leg, more so than the left. I have to play catch up. And just because I have a split on the ground, does not mean I have a full split in the air, I have to develop those muscles to extend my legs with no help. Same with the middle and straddle splits, they are my worst enemy, always have been. I’ve finally made a good amount of progress 3 years later, and they still hurt so good; it only took that long because I focused on them so little!! I’ve had to learn to embrace this hurt so good feeling. Now I actually strive to reach that feeling, to me it’s the feeling of slow but sure progress. It should never feel like a sharp pain, if it does you’ll have to find a variation that puts less pressure or torque on those areas. These pictures are with outside force pushing, or holding me down. I am actively deep breathing, on the inhale I squeeze my leg muscles and try to extend them outwards, and on the exhale I try to relax every muscle. I do 4 sets of 10 deep breaths. The engaging of the leg muscles also helps to lock you into position so you can catch your breath and then sink back into the stretch on the exhale. Just using my muscles to hold a middle split, like the iron x, is super difficult. To practice, I lay on my back and just pulse my legs up and down in a straddle split, without the wall or railing’s support. Then I just let them hang, and try to relax my muscles. All while breathing steady. You’ll see it in the video below. Down below is a video of almost everything I did in the first 2 weeks. I have been teaching so much lately, that I’m getting in my dynamic stretching routine about 5 times a week. Then when I’m by myself I film and go into the deep static stretches and poses. I can’t say enough how much just the consistent warmup and dynamic stretching routine has helped strengthen my flexibility. I completed the dynamic stretching routine number 2 before doing these stretches. You’ll notice after every deep stretch, I did a reversal strength & stretch. You’ll really want to find something that feels really good after a deep stretch. For me it’s leg crunches in a variety of different positions. I also incorporate the dynamic stretches in-between deep static stretches or poses. When I think over the past 3 years the biggest thing I have learned is that it’s not about holding stretches for a long time until you make improvements. Its about strengthening your muscles with proper form, using body weight, resistance, or external weight and breathing deep into stretches trying to relax the specific muscles necessary. Essentially just trying to make what was once uncomfortable, comfortable. It’s a process, like anything, it takes time and dedication. There’s no magic way around it. I could be satisfied with my flexibility and say good enough…but now I have developed a solid relationship with my body through stretching, a bond that may never be broken. That doesn’t mean I’m not incredibly thankful for what my body has already accomplished. I’m thankful everyday! Ever since I was little I dreamed of contortion lines, watched rhythmic gymnastics with awe, and just saw so much beauty in strength and flexibility. I’m not sure if my body can even go that far, but at least I can try and if my body ever starts to not like it, I’ll stop. In the meantime, stretching while building muscle feels good!! 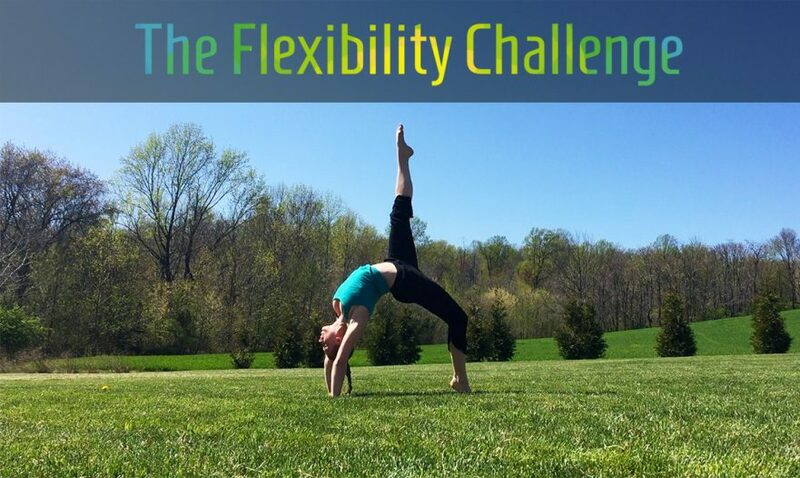 Good luck to everyone participating in the flexibility challenge! !